Prothane's polyurethane bushings are much more durable and will hold wheel alignment far longer than pliable rubber. Polyurethane Front Control Arm Bushings from Prothane will replace the original bushings in the upper and lower control arms, providing stable wheel alignment and improving handling while turning. Check out Prothane's control arm bushing kits for your vehicle below. If you're experiencing steering wander or hearing a clunking from the front of your vehicle then you could be experiencing symptoms of worn front control arm bushings. The original rubber bushings bend and flex with suspension travel and over time that shape change will have an effect on your handling, because the bushings can no longer maintain the camber angle (tilt) of your wheels. Prothane's polyurethane bushings are much more durable and will hold wheel alignment far longer than pliable rubber. There will be more road feel, or vibration, making it's way to the cabin, but your vehicle will feel much tighter when taking turns than it did with mushy rubber bushings. Prothane's bushings are Made in the USA and covered by a lifetime warranty. 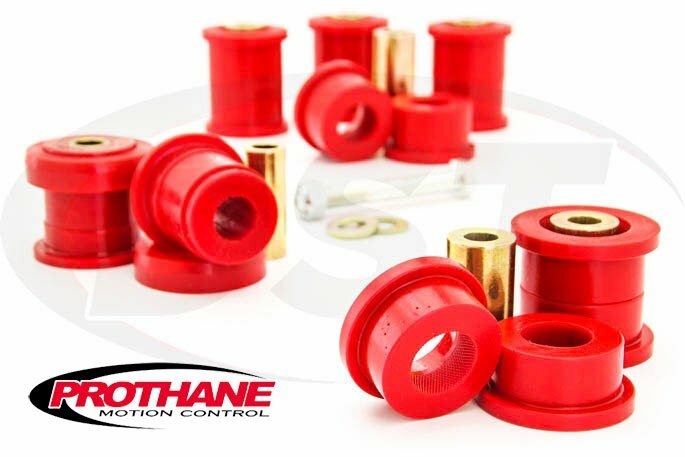 If you want a nice upgrade to your vehicle's handling check out Prothane's polyurethane front upper and lower control arm bushings.